I attended a performance of “Allegiance” on Oct. 12 in San Diego at The Old Globe. This play could provide a unique opportunity to educate a new generation of Americans about the injustice inflicted on the Japanese American community during World War II and to explore the unimaginably difficult choices they were forced to make resulting in conflicting paths taken to prove their loyalty to the United States. The play is disappointing in that its story line continues to be grossly misleading. It attempts to promote sympathy for those who answered “no” to loyalty questionnaire questions or refused induction into the U.S. Army (aka “resisters”) by seeking to taint the reputation of those who volunteered to serve in the 442nd Regimental Combat Team, a segregated Japanese American combat unit formed in the U.S. Army at the urging of Mike Masaoka. Although revisions have been made from the pre-opening version of the play, the revisions have not altered what I found to be offensive in the pre-opening version. The takeaway message of the play is that those who volunteered to serve in the 442nd were duped, and thus the resisters made the better choice as to how to show their loyalty to the United States. This message is told through a family split between Sam Kimura and his grandfather on one side and Sam’s father and sister on the other side. Sam answers “yes” to Questions 27 and 28 in the loyalty questionnaire, volunteers for the 442nd, and is a strong supporter of Masaoka during and after World War II. His grandfather answers “yes” to both questions and supports Sam’s decision to volunteer. Sam’s father answers “no” to both questions, is sent presumably to Tule Lake, and opposes Sam’s decision to volunteer. Sam’s sister marries Frankie, who refuses to serve after receiving a draft notice, resulting in imprisonment at a federal prison, and who strongly dislikes Masaoka. At the time of his sister’s death some 60 years later, she leaves Sam a “report” that supposedly documents that Masaoka advocated that the 442nd should be a segregated “suicide” combat unit with the expressed hope of a high death rate that could be used to publicize their loyalty to America. Upon receiving this information, Sam blames Masaoka for duping him into disobeying his father and joining the 442nd and for sending fellow 442nd comrades to be killed in action. “Allegiance” Fails to Address the Prejudice and Racial Profiling That Motivated Executive Order 9066. The play dwells on conflicting ways to show loyalty to America but fails to address the overt prejudice motivating governmental policies that resulted in Executive Order 9066 and Questions 27 and 28 in the loyalty questionnaire. The purpose of issuing EO 9066 was to provide security against sabotage, espionage, and fifth-column activity by persons of Japanese ancestry residing in the western part of the United States. There was not a single documented act of sabotage, espionage, or fifth-column activity committed by a Japanese American or a resident Japanese alien in the states covered by EO 9066. There was no justification or need for EO 9066. Furthermore, the report of the Commission on Wartime Relocation and Internment of Civilians documents that President Franklin D. Roosevelt, Lt. Gen. John DeWitt, and others were motivated by “prejudice, war hysteria, and failure of political leadership.” Even when the FBI argued that there was no justification for continuing to maintain the relocation camps, President Roosevelt refused to close the camps for fear of hurting his re-election chances. All adults imprisoned in the relocation camps were asked answer a loyalty questionnaire. Questions 27 and 28 were controversial. Question 27 asked if you would serve in the U.S. military. Question 28 asked in part if you would forswear allegiance to the Japanese emperor. These questions could have caused confusion for some because both questions did not apply to all of them. Only Japanese Americans should have been asked Question 27, and only the Issei should have been asked Question 28. By asking all adults to answer both questions, it would appear that the government was more interested in finding a large number of “no” answers to both questions to justify the existence of the relocation camps and its prejudicial decisions. “Allegiance” Over-romanticizes the Story of the Resisters. In the play, resisters are those who answer “no” to Questions 27 and 28 and those who refused to be inducted, but they still appear to believe in America. According to statistics in the report of the Commission on Wartime Relocation and Internment of Civilians, those who answered “no” to both questions were a very small number of those required to answer the questionnaire. Of the approximately 78,000 who were required to fill out the questionnaire, approximately 68,000 gave an unqualified “yes” to Questions 27 and 28 amounting, to 87%. Of the remaining 10,000, 5,300 answered “no” to both questions, amounting to 6.8%. The remainder failed to answer or gave a qualified answer. Of the eligible men who received induction notices, 315 refused to serve and 263 were convicted. The play fails to portray a third group of resisters who wanted to be repatriated and expatriated to Japan or who renounced their American citizenship. Approximately 20,000 filed applications to be repatriated and expatriated to Japan or about 16% of the evacuees, of which 4,724 returned to Japan. Over 5,500 Japanese Americans renounced their citizenship. These numbers could tell a more compelling story than the story of two groups of resisters depicted in the play. It would be unfair to conclude that all resisters wanted Japan to win the war. Their decision to answer “no” to both Questions 27 or 28, to file an application to be repatriated and expatriated to Japan, or to renounce their American citizenship may have been influenced by other reasons, such as the prejudicial treatment by the government, and not necessarily by an allegiance to Japan. The important point is that the resisters were in the minority and that all those in that minority may not have been loyal to America as compared to all who volunteered to serve in the 442nd. The 442nd Was Not a Suicide Battalion. The 442nd was not created or used as a suicide battalion. During World War II, 11,260,000 served in the U.S. Army, of which 318,274 were killed or missing. The number killed amounted to a 2.8% death rate. Approximately 33,000 Nisei soldiers served in the Army with 569 soldiers in the 100th Infantry Battalion and 442nd killed in action, amounting to a 1.7% death rate. In comparison, the Japanese army had 6,300,000 soldiers with 1,326,076 killed, amounting to a 24.22% death rate. The “light bulb” revelation in the play that soldiers die in war does not make the 442nd a suicide battalion. Death is an unfortunate reality of war that is known to every soldier who goes into combat. The members of the 442nd proved their loyalty by winning and not by dying. Together with the 100th Infantry Battalion, they fought in seven major campaigns, receiving seven Presidential Distinguished Unit Citations and earning close to 18,200 individual decorations, including 21 Medals of Honor. The 442nd, including the 100th, is often referred to as one of the most highly decorated combat units in U.S. military history. Members of the 442nd, 100th, and Military Intelligence Service were presented with the Congressional Gold Medal, the highest civilian honor that America can bestow, in November 2011. What distinguishes the valor of the 442nd, including the 100th, is that their valor was sustained in all their combat engagements over a two-year period. Their courage came from within themselves as a matter of honor, and their unparallel bravery on the battlefields is what won the war against prejudice at home. Masaoka’s Foresight in Advocating for a Segregated Combat Unit Was Brilliant. Masaoka had the foresight to urge the government to allow Japanese Americans to volunteer to serve and to create an all Japanese American segregated combat unit. The Army initially rejected the idea of a segregated combat unit because it did not want to give rifles to soldiers whose loyalty to America was suspect. The Army relented and created the 442nd. Masaoka was proud that he was the first to volunteer for the 442nd. Ironically, the racial prejudice that led to EO 9066 created the opportunity for Masaoka to advocate for a Japanese American segregated combat unit. Without this opportunity, Japanese Americans who served probably would have been assigned to non-combat duties such as clerks, cooks, mess hall attendants, etc. If the Army could have assigned Japanese Americans to other units, the Army would probably not have given rifles to them because the Army was still suspicious of their loyalty, and prejudice against them still existed. Due to Masaoka’s foresight, the 442nd was formed and given the opportunities to prove themselves. They showed their valor and assembled a combat record that has yet to be surpassed. This opportunity will never again be available to any ethnic group. Based, in part, on the contributions made to the war effort by the 100th, 442nd, and Tuskegee Airmen, President Truman ordered the military to be integrated, thereby eliminating the segregated Army units. This leveled the playing field, allowing minorities to compete for any military position or rank. The 442nd’s Combat Record and Masaoka’s Foresight Created a Lasting Legacy. Every member of the 442nd and their families should be proud of putting country first as a way to show their loyalty to America. The World War II Nisei soldiers created a legacy that has continued to benefit all of us. Their legendary military record was cited by members of Congress in support of passage of the Walter-McCarran Immigration and Naturalization Act, giving Issei the right to become naturalized U.S. citizens; the Civil Liberties Act of 1988, apologizing for the unjust imprisonment of persons of Japanese ancestry during World War II and awarding redress payments; the National Japanese American Memorial Act of 1992, authorizing the building of a national memorial in Washington, D.C. to honor the patriotism of Japanese Americans during World War II; and the Confinement Sites Preservation Act of 2006, creating a federal grant program to preserve the confinement sites used during World War II to imprison persons of Japanese ancestry under the authority of EO 9066. Though these Acts of Congress, their war record and Masaoka’s foresight have continued to fight the war against prejudice at home. In addition, their military accomplishments shattered the glass ceiling for all Asian Pacific Americans in the U.S. military. At the end of World War II, the highest-ranking Japanese American officer in the Army was a major. Today, there are over 30 Japanese American flag officers in the U.S. military, and about 70 Asian Pacific Americans who have also reached flag rank. A flag officer is either a general or admiral. Is “Allegiance” Another Titanic? As noted, the producers of “Allegiance” did make revisions to the play in response to comments received before opening. However, the revisions were equivalent to rearranging deck chairs on the Titanic. 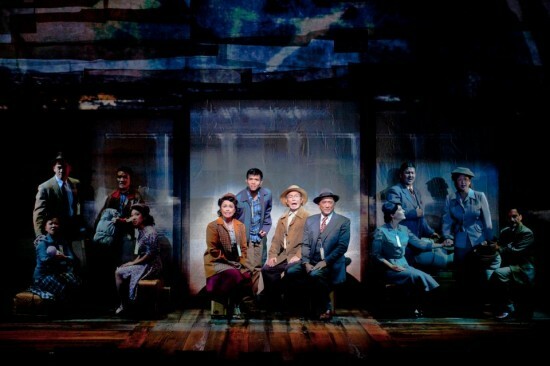 If the producers continue to try to convince audiences that Masaoka was a monster who duped Japanese Americans into serving in the 442nd as a suicide battalion, the play is doomed to hit an iceberg of facts and history that do not support this, and the opportunity that “Allegiance” could provide will sink. Gerald Yamada is president of the Japanese American Veterans Association (JAVA), whose Executive Committee approved this letter for public distribtion. He writes from Vienna, Va. “Allegiance” had its final performance in San Diego on Oct. 28 and is expected to open on Broadway next year. As I try to learn more about this history, I cannot help but realize the importance of application to modern times related to deportation of Hispanics and Arab-descendent imprisonment of those born in the United States. The atrocities related to this prejudice exemplified over 70 years ago is the most outstanding reality that still exists today. The Japanese-American community must now take the lead in this effort. I saw the show twice, and as I musical theater fan, I enjoyed the music, the awesome casts. As far as the story, I heard that the play is a story of a fictional family (Kimura). I don’t know anything about the fact on what had happend to Japanese community after WW2; this article is probably correct about the fact on what really happend; however, I do believe this show is an awesome step for us to talk about japanese community. This show is surely a first step to open up a converstaion. This article is putting the message of the show into the next level. I did not attend the play either, but appreciate both Gerald Yamada’s summary and the tasty tortilla chips that Gene Dorito’s family produce.